As a natural and logical extension from my Open XML spreadsheet guide, I’m writing a software library to create and manipulate Open XML spreadsheets. (Never mind that decompiler project I was working on… 2 months of coding… sunk cost… moving on…). I did some research (ok, an inordinate amount of research…) on the available spreadsheet software libraries out there, both free and commercial, both supporting Open XML (or .xlsx in any case) and the old .xls (Microsoft Excel in binary). I have 2 observations. First, there’s a plethora of classes in the library. It’s sort of expected. There’s support for a lot of functionality, and it just burgeoned into many classes. Personally, I hate it when I have to learn a new library. There’s a whole bunch of documentation and classes I have to read up on and experiment to just do a simple thing (printing a string of characters is the first thing I try). When I first encountered the .NET Framework, I was crushed. It’s redeeming feature was its extensive documentation, which made learning easier. Second, even though there’s support for a lot of functionality, it still takes quite a bit of code to accomplish what you want done (granted, much less than if you wrote low level code). Hey I wrote a guide on Open XML spreadsheets, I know how many lines of code needed to just create an empty Excel file, ok? But these are spreadsheet software libraries!. They’re supposed to make your life easier. In fact, much easier. I read that when the iPhone was designed, the engineers told Steve Jobs that it needed to have 4 or 5 buttons. Steve Jobs said no. One button (to rule them all). The iPhone now only has the 1 button. That will save an empty Excel file named “Book1.xlsx”. What, not Hello World enough for you? There. Now the file is named “HelloWorld.xlsx”. What, sheet name? Most (if not all) of the libraries I researched required you to add a new worksheet to an empty file. All spreadsheets have at least one worksheet. Why force the programmer to do it anyway? You don’t see Microsoft Excel forcing the user to add worksheets in a newly created spreadsheet file, right? (Excel even has 3 worksheets added by default). Alright, fine. The first worksheet’s name is by default “Sheet1”. You can rename it. There, happy? So, how do we set cell values? The cell with row 2, column 3 will have the value of PI. The cell with row 2, column 4 will have the string “This is PI”. Yes, the library supports cell references such as “C2” and “D2”. My opinion? They make better sense to a user with visual interface to the spreadsheet. It’s much harder to use when you’re programming with a non-visual interface to the spreadsheet. Good luck iterating through rows 2 to 500,000, with columns 1 to 1000 (financial reports, I’m looking at you…). Want to add a new worksheet? Hey, a software library is supposed to make your life easy. The second worksheet’s name is *drum roll*, “SecondWorksheet”. The string “Why am I not first?” is in row 5, column 5 of the newly added worksheet. How does the library know which worksheet to add which cell value? By magic. Ok, fine, it automatically keeps track of worksheets. When a user enters a cell value in Excel, does the user need to know which worksheet? No, because that information is implied. The user knows which worksheet because the user chose it already. And so does this software library. Oh yeah, I even have basic theme support! 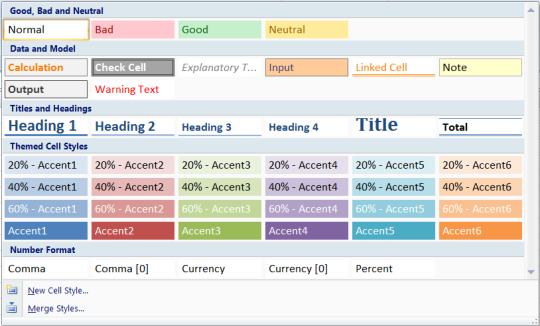 That gives you the Flow theme, one of the built-in themes in Microsoft Excel (note: only the fonts and font colours are supported). You can even design your own custom theme. There are 12 colours you need to define. These correspond to the 2 light colours, 2 dark colours, 6 accent colours, the hyperlink colour and the followed hyperlink colour. “ColourWheel” is the theme name, “Castellar” is the major Latin font and “Harrington” is the minor Latin font. The major Latin font is used when you apply the Title named cell style. The minor Latin font is basically the body font. What named cell style? A customer suggested supporting the feature. I am finishing up version 1 of the library, and it will soon be available. I’m targeting a launch in January 2012. 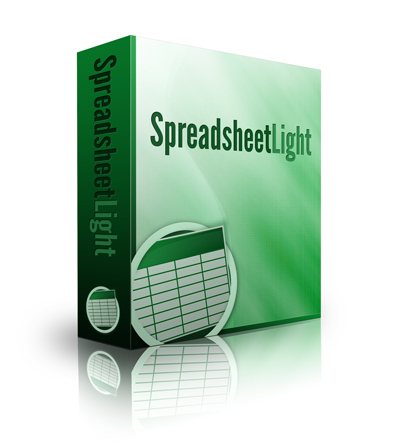 The software library will be called SpreadsheetLight. The primary idea is for it to be simple and clean. Simple for you to use, and you write clean code when you use it. 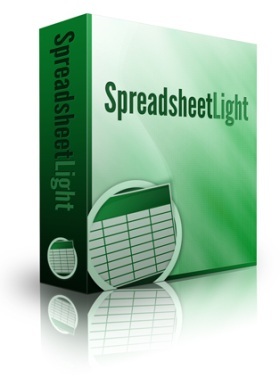 My internal tests show that SpreadsheetLight runs faster than 2 other free libraries. I won’t tell you which 2, because it’s not relevant, and because I’m automatically biased, and because it’s just not nice to the other programmers who contributed to those 2 libraries. The point is that it runs fast and is effective, which I’m happy about. I’ve been working with XML files for a while (if you’ve been reading my blog for the past few months, you’re probably sick of the XML-related stuff…). Specifically with Open XML. While I don’t always read and write XML files, I do refer to the Open XML ECMA-376 documentation and the Open XML SDK help file a lot. And then, I go look at some XML files, just to check that I wrote them correctly. I recently found out about XML Studio from Liquid Technologies. Disclaimer: I was contacted by a company representative, and given a free developer license for the software. But go check out their software if you’re doing XML-related stuff. I blazed through the list of features and benefits, and settled on one. Oh my fishballnoodles they can generate C# source code from XML files! It uses the XML Data Binder. So my first thought was: Can I use it to somehow generate source code that’s (sort-of) compatible with Open XML SDK? Short answer: No. But that’s because the XML files don’t have the Open XML SDK class names in them, so you can’t really have source code working with the SDK. However, my next thought was: Can I at least generate an XML file that would have been generated by the equivalent source code using the SDK? But I found out I could generate an XML schema from the XML file. Ohhkayy… Then I found out that generating source code required an XSD, an XDR or a DTD file. Alright, getting there. Then I thought I could create a worksheet with some typical data so that I could grab the resulting XML file with some of the possible data types, which I could then use to generate a corresponding XSD schema file, and then generate corresponding source code. Note the recursive problem solving ability of my programmer mind. And then it hit me that I could just use the correct schema file from ECMA-376. So I went to the second edition of ECMA-376 (latest is third edition as of this writing but not currently super-supported yet), and went to folder of part 1 (there are parts 1 to 4). Which has this very descriptive name of “ECMA-376, Second Edition, Part 1 – Fundamentals And Markup Language Reference”. Under this folder, there’s a zip file called “OfficeOpenXML-XMLSchema-Strict.zip”. And in that zip file is the motherlode of your schema dreams. As of this writing, I still haven’t managed to generate source code that does what I want (after a few hours of wheedling code around). But essentially, I’m trying to create an alternate Open XML SDK just from the schema information from ECMA-376. I’m pretty sure XML Studio wasn’t created for this in mind… I’ll keep you posted on my findings. If you have any XML editing stuff you think I should know, tell me, because I want to see if I can break, uh, I mean utilise XML Studio to its full potential. Ok, I’m going to reveal the big secret project that I’ve been working on for the last 2 months. I’m writing a software program that will decompile Open XML spreadsheets into C# and VB.NET source code. The first point meant that most of the classes were created one-off. It didn’t matter if you needed a class of type SomeClass multiple times. The SDK tool simply created another class of type SomeClass. If that class type was used multiple times, you’ll see variables named someClass1, someClass2 all the way to someClass21. It’s why I wrote about multiple use variables versus multiple variables. That’s one line of code. I just find that easier to pick and choose stuff I don’t want. You will notice that I do use object initialisers. “That’s hypocritical of you!”. Perhaps, but I use them when the number of properties is small. I’ve kept it to 3 for now. Object initialisers in my case also made it easier that I don’t have to declare and instantiate new classes with actual variable names. I understand why the SDK tool generates source code the way it does. It has to do with completely iterating through every single part and class of the root class SpreadsheetDocument. If you’ve ever written code to traverse a tree structure, you’ll know how tedious it can be. The one thing the SDK tool lacks about the source code it generates is context. It runs through the entire Open XML document structure like a squirrel looking for every single acorn on a tree. It doesn’t stop to check any acorn for size, defects or even if it’s an acorn. Look, winter’s coming soon, and the squirrel doesn’t have all day telling you that this particular acorn is related to that particular acorn, and no it doesn’t care how big the acorn is, it’s got the teeth to eat it, ok? Why are we talking about squirrels again? So, after about 20 thousand lines of code, I’m just barely getting my software into beta mode. Halfway through that, my heart sank with the enormity of the task. 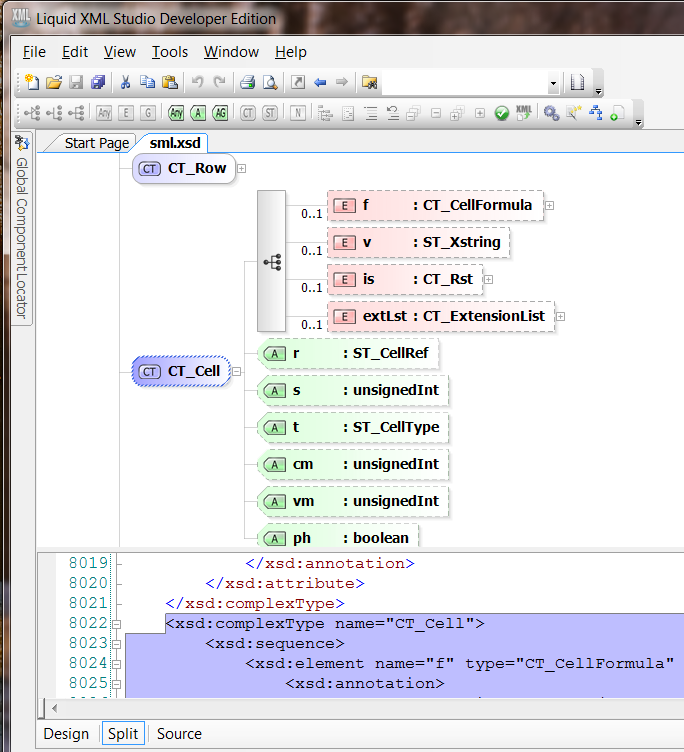 In order to generate more readable code, I cannot iterate through the XML tree structure like the SDK tool. I had to stop and make sense of what the class was. For some reason, the name conjures an image of a thread slowly unravelling a sock. But I like it. It stands for “Spreadsheet Open XML Decompiler”. 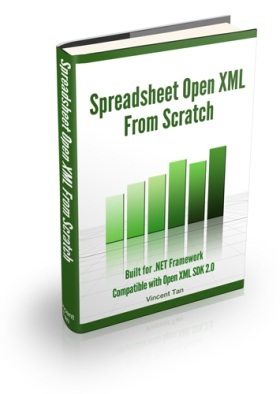 In the course of writing my guide on Open XML and Excel spreadsheets, I discovered some things about the Open XML SDK. There’s been some flak about the SDK or even on Open XML in general. But the price of the SDK is free, so you can’t beat that. While there are some inconveniences with using the SDK, the solutions and workarounds aren’t particularly nasty. The Open XML SDK is a software development kit (hence the “SDK”). It is not a conventional software library in that sense. It provides atomic functions that allow you to do all sorts of nifty things to create/manipulate Open XML spreadsheets, word processing documents and presentation slides. The keyword is “atomic”. This isn’t necessarily a bad thing. I know some companies will prefer not to use a software library (or third-party software). For example, government agencies or financial institutions, where data security is a concern and all software is (preferably) written in-house. The furthest they would allow is probably standard libraries. I’m not going into a discussion about whether Open XML SDK is a “standard” library, since it’s from Microsoft. There seems to be a lot of unhappiness with Microsoft. Is it because of their monopoly? Because Bill Gates is rich? I like the .NET Framework, because it makes coding easier. Open XML SDK is built on top of that, so that makes Open XML documents easier to create and manipulate. The graphics part is a common set of class objects used by the other 3. Out of the first 3, spreadsheets are typically used to hold lots of data. Financial data, fiscal summaries, call logs, database dumps and so on. Text documents and slides hold data too, but not usually as intensive as spreadsheets. Now it might surprise you that Open XML SDK offers no functions to manipulate any kind of data. None at all. Need to dump 100 database records with 8 fields into a spreadsheet? You need to write code to fill in a 8-column-100-row block of cells. Need to sort data? Do it within the database environment (there’s a SORT BY clause, you know? ), or write your own sorting function. Because Open XML SDK ain’t got it. This isn’t a big problem, but it does make writing code a little bit of a hassle. Particularly when you’re creating or manipulating a data-intensive spreadsheet. It’s not like when you’re attaching the DataReader object to a DataTable, and voila! All the data is nicely formatted and shown on a web page. But this is also where the flexibility of writing your own functions come in. When writing code with Open XML SDK, you have to put aside how you normally work with spreadsheets, text documents and slides. I’ll lump them together as “office documents”. Small “o” so it’s not copyright, right? As a user, you would normally just go about your task of typing text, inserting images, styling text, cut-and-copy sections of an office document. The order of how you go about doing it is irrelevant, because you get to see the final result. And the final result is all that matters. When working with Open XML SDK, you need to keep to an ordering of code sections. Each class in the SDK has to be appended to the appropriate parent class in the correct order, or you’ll get a corrupt file. This means your code has to be executed in the correct order too. Go to the Open XML SDK help file. Let’s say we look at the Worksheet class. There will be a section called XML schema. In that, there will be an XML tag called “sequence”. See those “element” tags? That’s the order. This code order isn’t a big problem. In your spreadsheet, it looks like an image is at the top, with a table of cell data below it. In code, you need to code for the table of cells first, then the image. Because that’s the order. The solution is to ignore the visual placements of the data sections in your office document, and look at what is in your office document. Then you rearrange all the data parts according to the order, and then write code for that. The Open XML SDK offers you flexibility in how you write your code and a great price (it’s free). It is backed by a large software company (Microsoft), so it’s not likely to disappear with no support in the future. Sure it’s not as easy to use, but sometimes your situation doesn’t allow you to use a third-party library (cost, licensing, security). Hey, it works well enough. And sometimes, when you’re in a tight project, that’s all you really need. That you produce software (that produces office documents) well enough. If you’re interested, you can check out my guide. I teach you how to create a spreadsheet with the standard functions in Excel such as text styling, image insertions, multiple worksheets, cell formulas. I also show you how to use a template in case you need something really complicated. And there’s working source code in C# and VB.NET. A video announcement (sort of) of the June 2011 issue of Singularity. Check it out here if you haven’t done so already.